Delivery of cassava cuttings of biofortified yellow cassava varieties rich in provitamin A. The WAVE project of the Environmental Institute for Agricultural Research (INERA), Mvuazi station and HarvestPlus organized a joint awareness day on brown streak, a viral disease recently observed on cassava, and the production and use of biofortified yellow cassava rich in provitamin A. The program was held on 2 December in Lukuakua village, located at about 50 km from the INERA station, west of the city of Kimpese, Central Congo Province. The sensitization day was organized at the request of the Lukuakua Cultivators Association (ACLU), which sent a distress signal to INERA to find a solution to observed damage on cassava roots in their area. The damage has been identified by INERA as cassava brown streak disease, a viral disease already in observed in some parts of DR Congo. The spokesperson for the association noted that the disease had been observed in the area since 2012. Tony Bakelana, researcher at INERA, explained that this disease is identified by the presence of brownish spots on the flesh of the cassava tuber, thus completely destroying the useful part of the plant and rendering the cassava unusable. He added that the disease is transmitted by cutting, which is the main planting material, and therefore the essential element of the spread of the disease. Farmers in the village were thus sensitized on the need to quarantine cassava fields affected by the disease, indicating that cuttings from these fields can no longer be used. Through the joint efforts of the project “Action to control cassava brown streak disease (CBSD) in the Democratic Republic of Congo”, implemented by IITA and the WAVE project of INERA as well as HarvestPlus, INERA is conducting research to develop varieties that could withstand this viral disease, and be made available to farmers, said Bakelana. 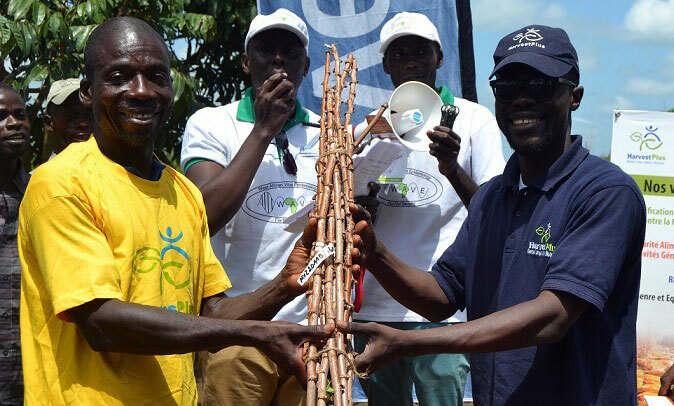 The three development partners proposed that the Lukuakua community cultivate varieties of cassava that have previously tolerated this disease, as well as the rich, biofortified yellow cassava varieties, which tolerates the disease and contains provitamin A, an important nutrient. HarvestPlus gave the community of Lukuakua cuttings of the biofortified organic variety “Kindisa” that the community is already cultivating. In addition, cuttings of eight other yellow varieties at prerelease stage were also given for multiplication and dissemination to other villages to ensure the food and nutritional security of the area.